Wasteland seems to attract this easily overlooked wildflower, which so often is buried beneath other taller vegetation. Only by using other plants for support can this annual achieve its full potential, sometimes attaining a height of 40cm. More often Red Dead-nettle sprawls lazily rather than standing erect, and then its flower stems rarely rise to more than 10 to 20cm above the ground. Unlike other dead-nettles, the toothed, heart-shaped finely-hairy leaves of Red Dead-nettle are all stalked, including those just above and below the flower whorl. The stems and upper leaves turn purplish, and those immediately below and above the flower whorl usually turn a strikingly deep purple. Flowers of Red Dead-nettle vary from pink to deep reddish-purple; they are two-lipped and 10 to 18mm long, forming a loosely-packed whorl around the stalk near its apex. The flowers are hermaphrodite - having both male and female organs - and they are pollinated mainly by bees. This low growing annual is very common in throughout Britain and Ireland. Red Dead-nettle is also common in northern and central mainland European countries including Slovenia. Found mainly on field margins, on disturbed wasteland, and beside country footpaths and hedgerows, this wayside wildflower is also quite a common sight in country churchyards. In Britain and Ireland Lamium purpureum blooms from March right through to October but is at its (rarely spectacular) best during springtime. This is often the first member of Mint family (Lamiaceae) to come in to flower, and in South Wales we have even seen it as early as February. The young leaves are edible and can be used either raw in salads or cooked with other vegetables. 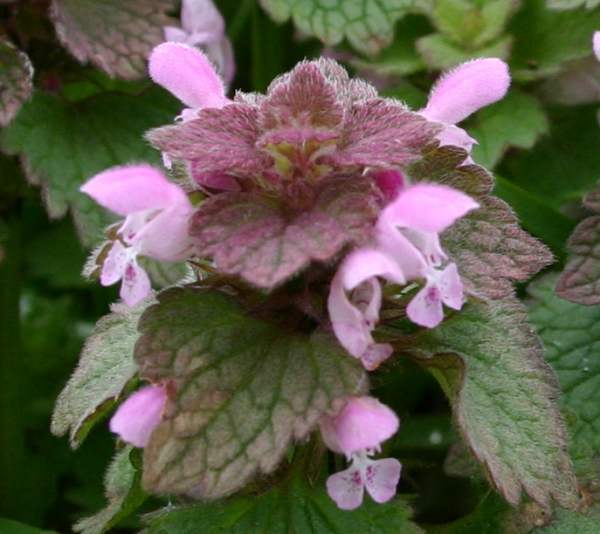 Herbal uses of Red Dead-nettle exploit its reported astringent, diuretic, purgative and styptic properties; in the past poultices made from fresh bruised leaves were used to dress wounds. Lamium, the genus name, is the Latin word for Dead-nettle; however, plants of this family were once known as Labiatae, and labia means lips. The distinctive two-lipped flowers of the Lamiaceae are sometimes referred to as bi-labiate. As you would expect, the specific epithet purpureum refers to the colour of the upper leaves (and sometimes the flowers too). White Dead-nettle Lamium album has, as the name implies, whitish flowers, and its leaves remain green. 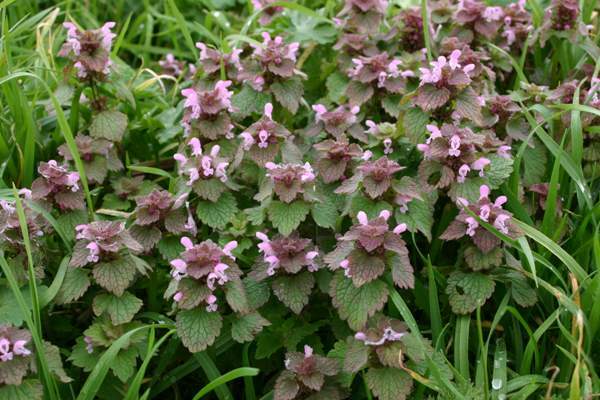 The Red Dead-nettle plants shown on this page were photographed in West Wales during March.